Home > Used Vehicles > 2012 Ram 1500 Sport,LEATHER,NAVIGATION,SUNROOF,TONNEAU COVER,PUSH BAR,VERY CLEAN,LOCAL TRADE!!!! 2012 Ram 1500 Sport,LEATHER,NAVIGATION,SUNROOF,TONNEAU COVER,PUSH BAR,VERY CLEAN,LOCAL TRADE!!!! On sale now! This vehicle was originally listed at $26900. We've marked it down to $24252. You save $2648. 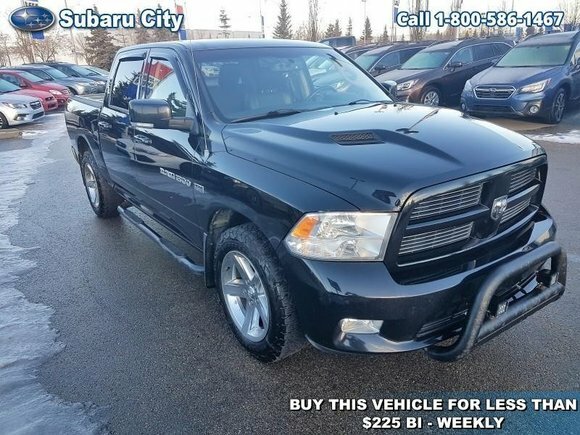 This 2012 Ram 1500 is for sale today in Edmonton. The reasons why this Ram 1500 stands above the well-respected competition are evident: uncompromising capability, proven commitment to safety and security, and state-of-the-art technology. From the muscular exterior to the well-trimmed interior, this truck is more than just a workhorse. Get the job done in comfort and style with this Ram 1500. This Crew Cab 4X4 pickup has 112000 kms. It's black in colour. It has an automatic transmission and is powered by a 5.7L V8 16V MPFI OHV engine. This vehicle has been upgraded with the following features: Bluetooth, Siriusxm, Fog Lamps, Aluminum Wheels, Steering Wheel Audio Control. To view the original window sticker for this vehicle view this http://www.chrysler.com/hostd/windowsticker/getWindowStickerPdf.do?vin=1C6RD7MT1CS234740. Buy this vehicle now for the lowest bi-weekly payment of $210.87 with $2629 down for 60 months @ 5.99% APR O.A.C. ( taxes included, $790 Administration and Secure Ride included / Total cost of borrowing $3748 ). See dealer for details. Want to try the 2012 Ram 1500 Sport?